This is Fiona Gray's race report from Ironman Brazil, it maybe a little late but she did get married in June and was in France watching the Tour for her Honeymoon so she does have a good excuse!! 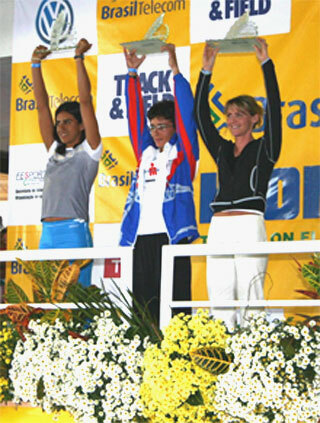 Ironman Brazil was on May 29th, my 3rd Ironman race, having done Lake Placid last year and Ironman Canada in 2001. It was somewhat nerve-racking thinking about racing in a country where I didn’t speak the language, but that would just make things more exciting! We went to Brazil with Endurance Sports Travel, a company owned by Ken Glah, a professional triathlete, which took care of a lot of the important details of the trip, thanks! At that time of year, Brazil is heading into winter so the temperatures were on the “cooler” side at 21oC during the day and 15oC in the mornings and evenings. The locals dawned winter coats, scarves and toques. While the “foreigners” were in shorts, tees and sun tanning! Even some of the local dogs had coats! To us however, the weather was quite balmy and very enjoyable. I woke up at 4am having a good 6 hours of sleep – you can actually sleep the night before the race once you have done your first Ironman! Checked outside to see the weather – so far calm waters and it looked like the sun would shine – Yipee!! I had breakfast at 4:30am and back to the room to get ready and then off to the shuttle taking us to the Transition area at 5am. The weather was outstanding, calm winds, no clouds, the temperature in the morning was around 14oC and reached 22oC and sunny during the day. We couldn’t have asked for anything better. It definitely wasn’t anything like Lake Placid last year with torrential rain, gusty winds and a dark sky all day! Waiting in line to get body marked took about 15 min…too long to be hanging out waiting! I checked my bike, pumped up my tires and put my waterbottles on my bike. Into the change tent to put my nutrition in my transition bags and to put my wetsuit on – where did time go there was only 20 min to go to the start – in a bit of a panic I forgot to but on lube in various critical areas, I would be reminded of this later in the race. I put my wetsuit on and made my way down to the beach for the start along with other Canadians in the race – Brandon, Tom, Derek (NRG Performance Training Athletes) & Nicole. Nicole and I took our “spot” at the back of the beach and said goodbye & good luck to Brandon who made his way to the front of the swim start! Athletes were very friendly at the start, a few commented on staying to the right because there was a large shoal of rock to the left – great observation, however, once the race started the left side of the field swam towards/into the shoal of rock – which then caused a huge pile up as this group was now swimming perpendicular to everyone else to get around the rocks. Not the most direct route around the course! My swim felt very comfortable with a good consistent effort (once I made it around the rock obstacle). However, when I finished the first lap & got onto the beach my split time was slow (36:14), but I figured that since I had almost swum into a rock and had to reroute this was why my time was slower than anticipated (32:00). I continued on and picked up the pace for the next loop as I felt great and thought I would negative split the swim, having a faster second loop. Well, not the case, in fact it was slightly slower…puzzling, as my effort was greater and I thought I was swimming more of a direct course! I got out of the water at 1:14 and made my way to the change tent – definitely disappointed in my swim time, as I have consistently swum 1:04. Hearing my coach, Nigel Gray (NRG Performance Training), in my head saying not to worry about the time – I didn’t. Onto the next task…the bike. My bike goal was to stay relaxed and keep my heart rate and power in my predetermined zone/range (determined by a Lactate Test). I have been training with a Power Tap for a few months now and decided that it would be a good idea to race with it as well. The power output feedback was a critical element to my performance. The bike was a 2-loop course taking us into downtown Florianopolis, through a tunnel and a section of highway not open to cars. The course offered flats, climbs, descends and tactical corners, a bit of everything. The ride was uneventful for me except that I hit a pylon on the second loop of the bike course, fortunately I stayed upright, the car beside me didn’t swerve when the pylon hit it and the pylon bounced off the car in the other direction. Boy, that was close! Riding with the Power Tap enabled me to maintain consistent watts (power output) throughout the ride whether riding the flats, ascending a hill or descending. In the beginning of the race I had a lot of people pass me, that’s what happens when you get out of the water in the first half, however, everything changes in the second loop, I was passing a lot more people than the other way around. The name of the game is being consistent and maintaining a strong mental focus on your whole game plan. I said goodbye to my bike and went into the change tent to put on fresh socks, my shoes, my hat and sunglasses, grab nutrition and use the facilities. Now, off and running! My goal was to run a sub 4-hour marathon so I mentally broke the race down in sections and attacked it bit by bit. Someone once said to me not to look too far into the race, think about what is going on right then and there. My motto during the race is “live in the moment”, it can be a mental and physical disaster thinking too far into the race – so I focused on my form, my heart rate and my nutrition plan. I felt great! The marathon was a one-loop route, with a cobble stone section, a 19% hill that we had to run up and down and a few other rolling hills and flat sections. I really enjoyed this run course, however, the sun goes down very early in Brazil and by 5:30pm we were running in the dark. I felt very strong throughout the whole run, making all of my time splits comfortably. I even felt that I got stronger by the end of the run. It is an amazing feeling to race strong and pass lots of people on the run; it felt like they were standing still. Unfortunately, we did not have letters on our legs marking our age category so I had no idea where I was in my age group or what the age was of the women I was passing – didn’t matter I passed them anyway! That gives you a lot of motivation to keep on trucking. I ran in my predetermined heart rate zone for the whole race except for the last 2.5 km, where I picked up the pace and ran in the next zone level. It truly felt like I was sprinting, it felt great, but I didn’t want to stop cause I knew it was going to hurt. I turned the last corner to the finish line, lots of spectators cheering (very motivational) and there was my mum, Brandon and Scott at the finishing shoot cheering me on! I finished in 11:25:30, with a 50 min PB. I was asked if I would like a massage or if I needed medical attention, no not for me, I felt great! Well, I walked away from the finishing line and everything in my body tightened up, it was so hard to move, everything was stiff. So I decided to get that massage. The massage felt great until they asked me to turn over – my muscles couldn’t bare the thought of movement. Back out to watch the rest of our Canadian contingent finish. Brandon was the first to finish at 10:32, I was next, then Nicole at 12:25 (first Ironman), Tom at 13:16 (first Ironman), Derek at 13:22 and George at 15:24 (first Ironman). What a great day, everyone was delighted, sore and tired all at the same time. Congratulations. Ironman Brazil was a fantastic race, despite the fact that they moved the swim buoys during the race (all swim times were longer) and the large amount of drafting on the bike. My fear of the language barrier was truly no problem as I picked up a Portuguese phrase book in the airport and learned a few words to help our journey. It proved helpful to know my race number in Portuguese. I found out the next day that I was 3rd in my age group and that I qualified for Ironman Hawaii. To the dismay of many I did not take the Hawaii spot, it was not in my cards for this year, but I am extremely proud of my accomplishments! Being up on the podium was exhilarating – so that’s what Lisa Bentley experiences! Thank you to Nigel for an outstanding training program, for your support and advice throughout my preparation and the race. Thank you to Brandon and Nicole for being awesome training partners and the Athletes First Indoor Cycling group who helped keep me motivated through the winter months. Who says you can’t have a good race after training indoors throughout the winter?!! Onto my next challenge – my wedding on June 26, 2004!